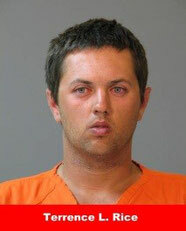 On May 15, the Calcasieu Parish Sheriff’s Office received a complaint regarding Terrence L. Rice, 25, 6675 Hwy 90 East, #238, Iowa, sending sexually explicit messages to a 16 year old, who was a family acquaintance, on Facebook. During the investigation detectives learned that Rice had asked the 16 year old girl sexually explicit questions and also asked her to send him photographs of herself in her underwear. Rice also instructed the girl to delete the conversation so he would not get caught. The girl did not comply with any of Rice’s requests and immediately showed her parents. When questioned by detectives, Rice confirmed that he had sent the messages. On June 1, he was arrested and booked into the Calcasieu Correctional Center and charged with indecent behavior with a juvenile. Judge Clayton Davis set his bond at $10,000. CPSO Detective Cinnamon Salvador is the lead investigator on this case.